At Homestead Custom Cabinetry, "Custom" is our middle name for a reason. We work with designers and architects to craft whatever you can imagine and build it in a manner that meets our high quality standards. Our goal is to always say "yes" to our dealers and their customers when they make unusual requests. We love the art of cabinetmaking, so we welcome the challenges of engineering cabinetry to suit your special design requirements. If you want something you don't see here, feel free to contact us! Our standard wood frame (SWF) cabinets are constructed using either 3/4" thick or 1" thick face frames. This is the traditional method of North American cabinetmakers. Using this construction method we provide inset doors with multiple details around the inset opening, such as a 1/4" or 3/8" bead, a chamfer, an ogee profile and several others. This style lends itself to traditional and what we call transitional styles. We offer an expansive collection of door styles, woods and finishes that allow you to make your space uniquely yours. Some will refer to this construction method as "Full-Access" or "European" or "Full Overlay" construction. This construction method originated in and is prevalent in European countries. 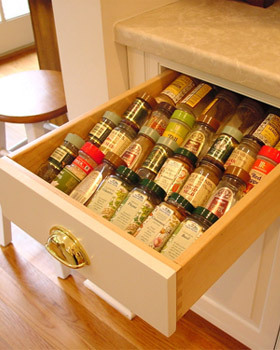 The absence of the face frame allows access to the full width of the cabinet from the front. These cabinets are constructed similarly to SWF cabinets using dowel construction. The main difference is that in place of the hardwood face frame, the front edges are covered with a veneered edge band. Frameless cabinets are unique in that the doors overlay the edge banded face and practically cover the full width of the cabinet front. This cabinet method lends itself to more contemporary and transitional styles, although a good designer can create a very traditional look using this type of cabinetry. We use 3/4" plywood construction for this style, but we also offer a White or Hardrock Maple Melamine on particle board option. Homestead offers many components to complete a design or to bring organization and convenience to your cabinetry's interior. Many of our components are custom designed wood components made specifically for your application or they may be interior accessories from some of the most innovative suppliers in the industry. The possibilities available in exterior detail and carved components are almost endless. Whatever the component may be, you can be assured of the highest quality available. We encourage you to work closely with your designer, communicating your desires and allow them to open the world of efficient, functional design to you. In addition to this collection, requests for other exotic woods are always considered based on availability. Homestead Custom Cabinetry's standard door collection is one of the largest in the industry! Choose from over 80 standard door styles or have us create any door style to match one you may have seen. You can even create a totally unique style of your own! We also offer a complete collection of complementary drawer fronts in a variety of styles and finishes to suit any project. Homestead Custom Cabinetry's reputation for quality is, in no small part, due to its unsurpassed finishes. Our pallet of standard colors, combined with a broad menu of optional effects and features, yields an endless array of finishes that will surely catch the eye of the most discerning customer. However, if the finish color on Aunt Martha's heirloom knitting box is a must-have, our finish technicians can come up with a custom color match. 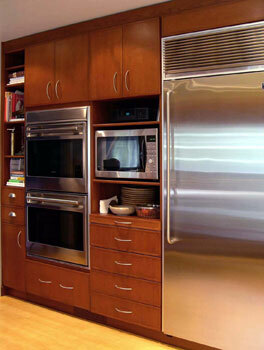 Homestead Custom Cabinetry uses only the highest quality industrial-grade finishes. Both the catalyzed sealer conversion varnish system and the post-catalyzed, acid cured enamel paints are the finest available. Both provide durable, low maintenance finishes that offer many years of beauty and enjoyment. Contact us today about custom cabinetry for your design clients. Or find a dealer in your area.